Rakusan did not include the Fan Series in his main sequence numbering. Therefore, the original number used for each of the 36 Series prints has been modified to identify the Fan Series members of its theme. The five different fan silhouette shapes have been here assigned arbitrary numbers 1 through 5. To indicate a fan design these shape designations are added to the 36 Series number separated by a hyphen. 114-2 is the Fan Series design with fan shape 2 in the 114 Ivy theme. Like all other designs in this series, 114-2 was only produced in a single print run, and few copies are currently documented. The individual designs in the 114 Ivy theme were completed in at least two stages. Three of the five fan designs (including 114-2) have seal C which indicates a carving date during the first half of 1934. The other two fan designs and the 36 Series design 114 have seal B which indicates a later carving period closer to the time of publication. 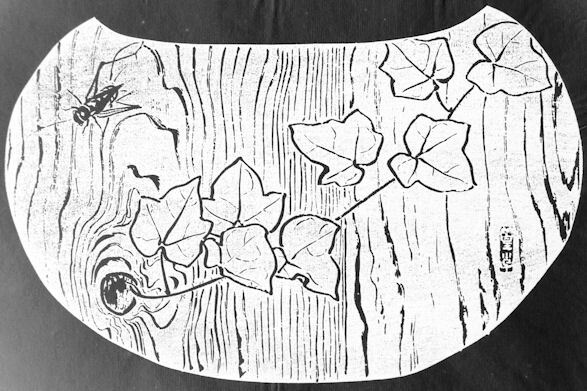 The composition of 114-2 includes a single shoot of ivy extending across a section of planking. At upper left is a field cricket. The orientation of the surface of the planks is uncertain, and it could be either horizontal (as with flooring) or vertical (as with a house wall or fence). The different patternings of the wood grain show that there are two planks which meet at a straight vertical seam near the middle of the composition. There is a knothole at lower left in the left plank. 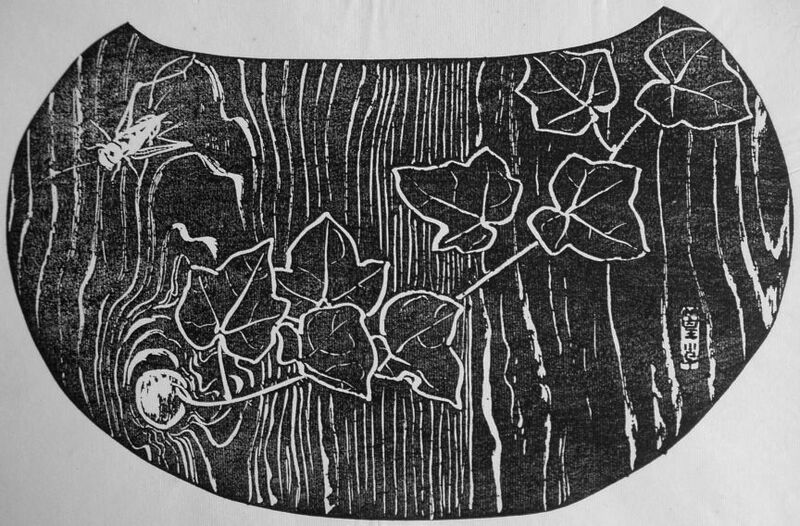 The ivy and planking are rendered as a rather simple line drawing which works equally well viewed as ishizuri or as the original. However, the cricket has finer details which make identification possible, and is correctly dark colored only in the original sketch. The general name for any field (or garden) cricket (family Gryllidae) is 蟋蟀, こおろぎ, コオロギ, koorogi, 'cricket'. The species illustrated in 114-2 is probably Oriental Garden Cricket (Emma Field Cricket), Teleogryllus emma, 閻魔蟋蟀, えんまこおろぎ, エンマコオロギ, en-ma koorogi, lit. 'town-witch cricket'.